Whenever a new food, drink or supplement hits the market with great fanfare about its health benefits, I’m suspicious… but I’m also curious. Recently, I’m seeing more and more people sipping coconut water out of bottles and boxes and sometimes even from straws stuck right into the fruit. I’ve seen health claims tout the ability of this elixir to cure dandruff and prevent acne, treat kidney stones and boost metabolism. I’ve even seen it called “nature’s sports drink,” due to its high electrolyte content. Unsurprisingly — since they’re always on the alert for such an opportunity — beverage giants PepsiCo and Coca-Cola bought in. Pepsi bought Amacoco, the largest coconut-water company in Brazil, and Coke invested heavily in Zico, an up-and-coming US coconut-water company. Does the word “fad” come to mind? Let’s get some perspective. Don’t confuse coconut water with coconut milk, which is a lot richer and, in my opinion, far more flavorful. Coconut water is what you’d hear sloshing around if you shook a young coconut. In fact, the taste of coconut water is not much like coconut at all — it’s semisweet and slightly nutty. I found it pleasant and refreshing, though my friend, who also tried it, didn’t care for the flavor at all. It’s valid to use coconut water as a sports drink, because it contains plentiful electrolytes (such as the potassium and sodium). I did a comparison to Gatorade, and found that eight ounces of coconut water has fewer calories than Orange Gatorade (44 versus 50)… way more potassium (487 mg versus 30 mg)… and slightly less sugar (10 grams versus 14 grams). 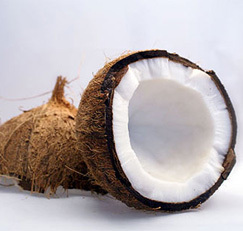 Coconut water is available in supermarkets, health-food stores and even in some vending machines in single-serving sizes (average price, $1.70). “Coconut water is a nice refreshing option,” Bowden said. “But as far as I am concerned, with zero calories, water is still the ultimate rehydration drink.” So coconut water is fun and tasty, but it’s not going to change your life.